"....I would like to add in the school uniform to his body. The uniform pictures and logos are as attached. Also, can I request the theme to be him as a student smacking a volleyball ferociously in the direction of the viewer. The uniform can be dressed sloppy and tucked out....."
"Hey jit, this is kok guan. I just wanted to say thank you so much!! You are really a superb caricaturist, thinking out of the box and translate your thoughts into a creative piece of caricature. 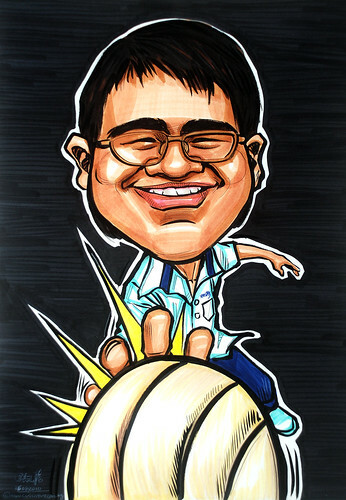 My friend was really delighted with the cartoonified picture of himself."